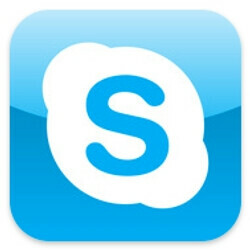 Skype, probably the most popular free VoIP client, has finally been updated to support the 4-inch display on the iPhone 5. Earlier, the app would be letterboxed and not use the full four inches of screen real estate. This newest version of Skype, 4.1.2, will run on devices with iOS 4.3 and later. It is now optimized for the iPhone 5, but it would still run on the iPhone 3GS, 4 and 4S, as well as the iPad and iPod touch. The new version is also fixing the usual few little bugs and you can grab it for free at the link below. Funny how even apps being updated to fit a new screen counts as news in AppleLand. Wow............!!!!!!!!!!!! And, more importantly, that's not the way Skype looks like on iPhone 5 (4 or 4S)! Let me know when it gets updated to 4.1"?